The sandy hills "Rødme Svinehaver" in the middle of Fyn has a flora characteristic for poor grassland on sandy soil. 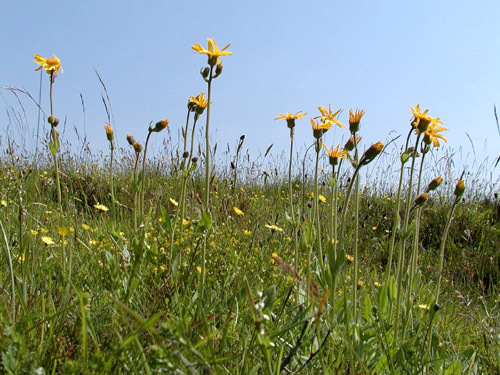 A characteristic species is Arnica montana in the right picture. This species has now its only site outside Jutland in "Rødme Svinehaver". 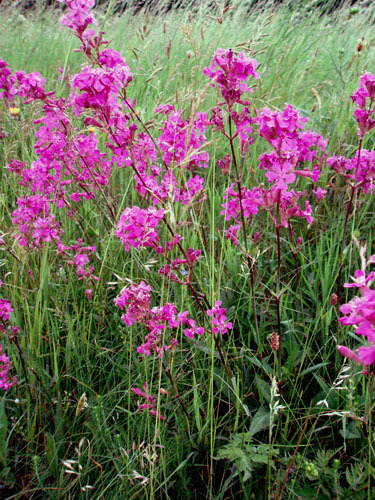 A number of other characteristis plants from poor, sandy grassland can also bee seen in "Rødme Svinehver" as Platanthera bifolia ssp. bifolia, Deschampsia flexuosa, Vaccinium vitis-idaea, Polygala vulgaris, Calluna vulgaris, Hypochoeris radicata, Anthoxanthum odoratum, Potentilla erecta, Galium saxatile, Danthonia decumbens, Carex pilulifera, Nardus stricta, Solidago virgaurea, Veronica officinalis, Festuca ovina, Hieracium pilosella, Campanula rotundifolia, Aira praecox, Ceratium semidecandrum and Rumex acetosella. In and around the small ponds there are some species from humid, poor sites such as Drosera rotundifolia, Juncus squarrosus, Apium inundatum, Dactylorhiza maculata ssp. maculata, Peplis portula and Agrostis canina. More infrequent a few lime-loving species can be found as Platanthera chlorantha, Briza media and Cirsium acaule. Grassland on sandy soil has usually a low content of lime and other nutrients and the soil is acidic. Other typical species in this type of vegetation - not all found in "Rødme Svinehaver" - are Ranunculus bulbosos, Saxifraga granulata, Armeria maritima, Lychnis viscaria (left picture), Scorzonera humilis, Thymus serpyllum and species from heaths as Empetrum nigrum, Genista anglica and others. A number of more or less rare species prefer the sandy grassland as Pseudorchis albida, Gentianella campestris, Vicia orobus, Botrychium matricariifolium and Antennaria dioeca. In Denmark most of these species can only be found in Jutland. Back to The hights in the middle of Fyn.